The OnePlus X has been making headlines for a the last few weeks, and also there have been several leaks and rumors in the air about the OnePlus X. today, the alleged device was spotted on Chinese telecom certification website Tenaa. The listing reveals a few specifications about the smartphone, but without any names mentioned. From a separate source, we also heard that the website has given details about its processor, display, StyleSwap covers and a few more specs. The upcoming OnePlus X smartphone was listed on the website with the model name One E1001, along with the images as we can see above. 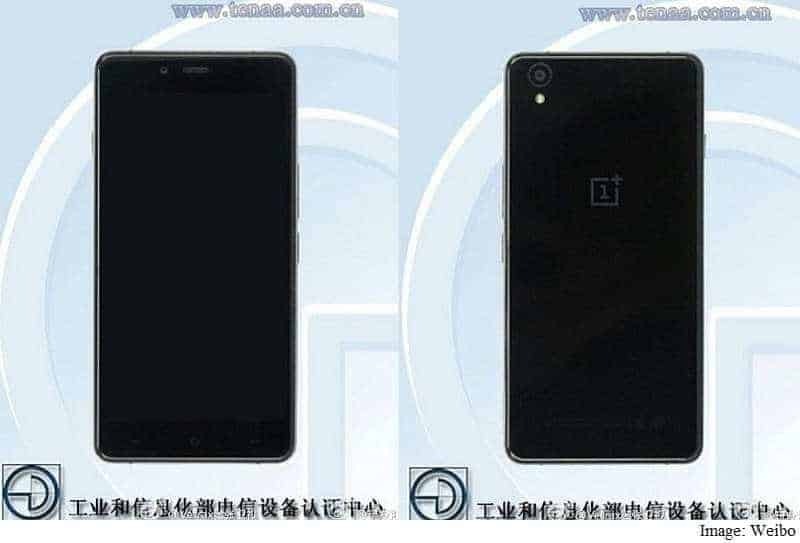 The phone seems to be OnePlus X, because the image posted by an Weibo user is showing the same phone which got listed by the US FCC recently. Just like the OnePlus 2, we can see a notification switch on the left side of the OnePlus X. There are 3 capacitive buttons below the display and the side bezels are metal build. The listing states that the phone will have a 4.9-inch display, carrying up a dimension of 140x69x6.9mm and will pack a 2450mAh battery. Another website called GForGames suggested the possible features and specs that will be there on OnePlus X. According to their report, the OnePlus X will have a ClearForce-ready display, which is similar to force touch that we see in iPhone 6S. And they say that the phone will have a 5 inch display, along with ‘SideTouch’ technology just like Mi4c using which you can launch apps or the device camera application by touching the left-side of the screen.The report also indicated that the OnePlus X will sport dual front-facing speakers, but that is not visible in the Tenaa listing images. OnePlus X will sport a 13-megapixel rear camera with Sony IMX258 sensor, but no Optical Image Stabilization, however it is expected that the rear camera would be featuring a combination of PDAF (Phase Detection Autofocus) and EIS (Electronic Image Stabilisation), which we have seen in Google Nexus phones. In terms of connectivity, they believe OnePlus X will haveFM radio, NFC, and an IR blaster. Also, the phone will have swappable covers, however the battery is non-removable and the phone will be IP67-certified. The OnePlus X is said to run on a MediaTek MT6795 SoC, coupled with 2GB of RAM. The report also states that the OnePlus X will feature wireless charging.